Alcohol dependence is a severe form of alcohol use disorder and it may first manifest when a person develops withdrawal symptoms after stopping alcohol - either due to family pressure, self-motivation, physical ill health or difficulty in procuring alcohol. It is a common misconception among regular drinkers that stopping alcohol causes more problems than continuing it. This may be partly true in those who have developed dependence as they may experience withdrawal symptoms including autonomic arousal, hallucinations, seizures and delirium tremens (DT). Since many people underplay or minimize their drinking behavior, they tend to develop withdrawal symptoms when hospitalized for other physical problems and not for alcoholism forming a substantial part of consultation-liaison psychiatry. Our aim was to review the evidence base for the appropriate management of the alcohol withdrawal syndrome using pharmacotherapy. This review informs readers about medications to be used for treating alcohol withdrawal, their dosing strategies to be used and managing specific complications arising during alcohol withdrawal such delirum trements (DT) and alcohol withdrawal seizures. We specifically sought articles relating to medications commonly used in India and those that can be recommended based on strong evidence. We searched Pubmed for articles published in English on pharmacological management of alcohol withdrawal in humans without any restriction on the publication date. We used the following medical subject heading (MeSH) terms: "Alcoholism", "alcohol withdrawal seizures" and "alcohol withdrawal delirium" and "drug therapy". Although "alcoholism" alone yielded 43921 articles, "alcohol withdrawal seizures" returned 103 results, "alcohol withdrawal delirium" 911 results; combining these terms with the MeSH term "drug therapy" yielded 1037, 10 and 102 articles respectively. Articles not relevant to the topic were excluded based on the titles and abstract available. Full text articles were obtained for the 24 articles relevant to clinical practice at this stage. Cross-references mentioned in the full text articles were checked for other relevant articles. Further search for books, monographs and articles relating to thiamine supplementation, neurobiology of alcohol withdrawal state were done by hand-search and other convenient means. A total of 100 full text-articles, books and monographs were identified. There were four meta-analyses, nine systematic reviews and 26 review articles. Other publications were randomized controlled trials, observational studies, case reports, manuals and monographs. By exclusion of articles relating to drugs with poor quality of evidence and inclusion of the latest version of Cochrane reviews, we were left with 35 published studies for our review focused on the clinical management and the rest are reports, books and monographs. The literature was reviewed independently by the two authors. We tabulated the major recommendations from each source as regards the management of alcohol withdrawal with respect to severity of withdrawal, doses and regimen used in each study and the outcomes. Alcohol is a central nervous system (CNS) depressant, influencing the inhibitory neurotransmitter gamma-aminobutyric acid (GABA). Ordinarily, the excitatory (glutamate) and inhibitory (GABA) neurotransmitters are in a state of homeostasis [Figure 1]a. 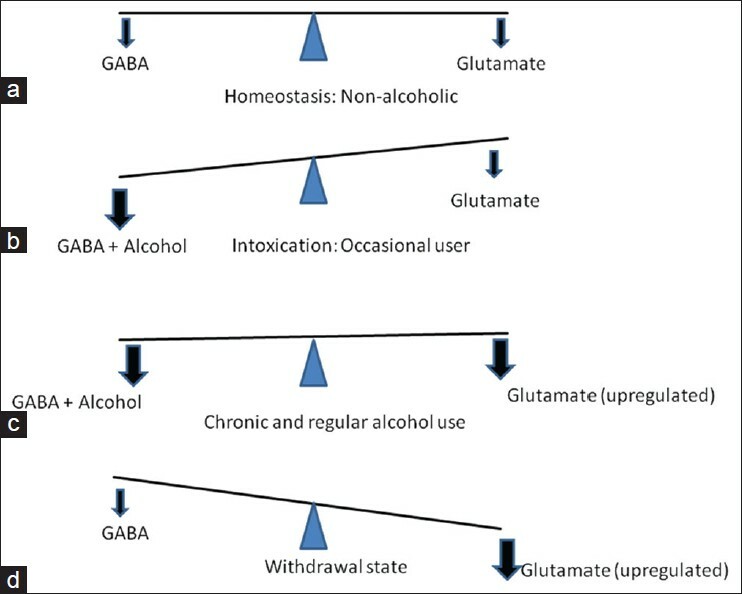 Alcohol facilitates GABA action, causing decreased CNS excitability [Figure 1]b. In the long-term, it causes a decrease in the number of GABA receptors (down regulation). This results in the requirement of increasingly larger doses of ethanol to achieve the same euphoric effect, a phenomenon known as tolerance. Alcohol acts as an N-methyl-D-aspartate (NMDA) receptor antagonist, thereby reducing the CNS excitatory tone. Chronic use of alcohol leads to an increase in the number of NMDA receptors (up regulation) and production of more glutamate to maintain CNS homeostasis [Figure 1]c.
Dopamine is another neurotransmitter involved in alcohol withdrawal states. During alcohol use and withdrawal the increase in CNS dopamine levels contribute to the clinical manifestations of autonomic hyper arousal and hallucinations. Repeated episodes of withdrawal and neuroexcitation results in a lowered seizure threshold as a result of kindling  predisposing to withdrawal seizures. A clear evidence of recent cessation or reduction of alcohol after repeated and usually prolonged and/or high-dose use. 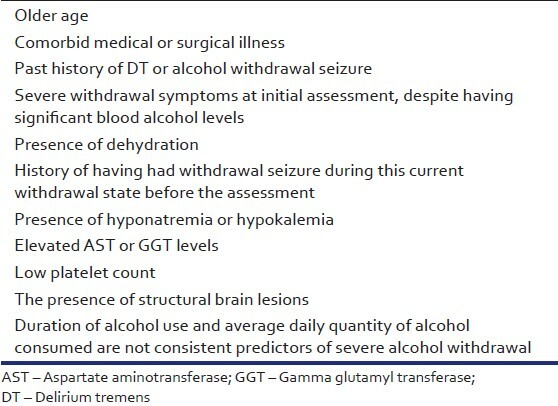 The patient shows symptoms of alcohol withdrawal  [Table 1] that are not accounted for by a medical disorder or by another mental or behavioral disorder. The diagnosis requires adequate history of the amount and frequency of alcohol intake, the temporal relation between cessation (or reduction) of alcohol intake and the onset of symptoms that may resemble a withdrawal state. When the onset of withdrawal like symptoms or delirium is after 2 weeks of complete cessation of alcohol, the diagnosis of alcohol withdrawal syndrome or DT becomes untenable, regardless of frequent or heavy use of alcohol. 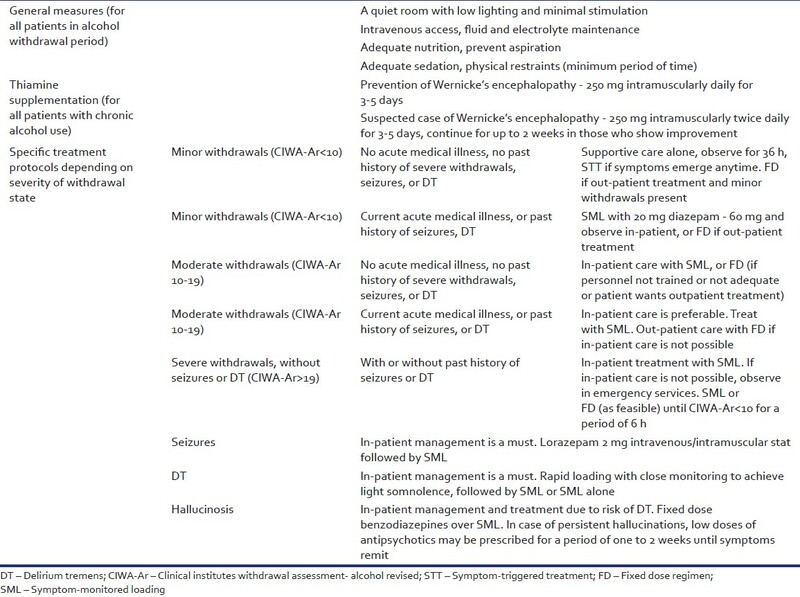 [Table 2] gives a clinical description of alcohol withdrawal syndrome by severity and syndromes. ,, [Figure 2] depicts the time course of symptom evolution. Once a clinical diagnosis of alcohol withdrawal is made, we must review the patient's condition from time to time for the appearance of signs of medical or neurological illness which may not have been evident at admission but may develop subsequently. Delirium is a clinical syndrome of acute onset, characterized by altered sensorium with disorientation, perceptual abnormalities in the form of illusions and hallucinations and confused or disordered thinking, psychomotor agitation (or retardation) with disturbed (usually reversed) sleep-wake cycle. In most cases, it is secondary to a general medical condition causing disturbance in the basic functions of the brain. It could be due to infection, toxic, metabolic, traumatic or endocrine disturbances. DT is a specific type of delirium occurring in patients who are in alcohol withdrawal states. 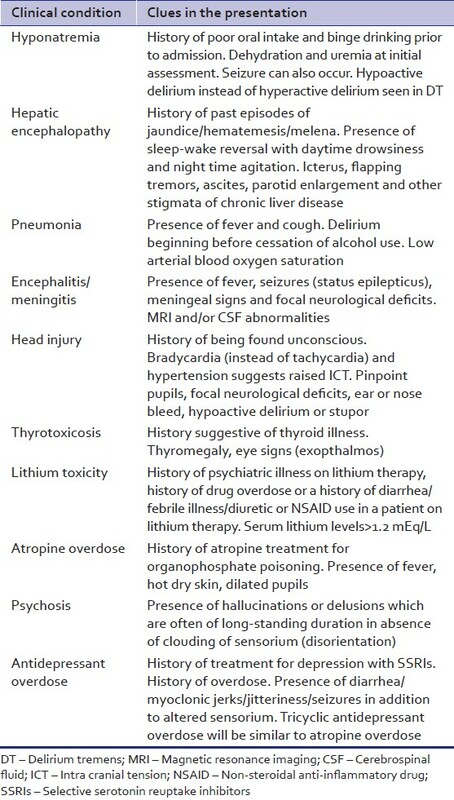 Alcohol withdrawal delirium is typically associated with psychomotor agitation (hyperactive delirium) and in cases of hypoactive delirium comorbid hepatic encephalopathy, hyponatremia or other medical illnesses [Table 3] must be ruled out. This is especially important in a patient who has not had previous history of DT. Alcohol withdrawal delirium has a high mortality of about 8%. Hence, it is important for clinicians to be able to predict it. The risk factors for DT were analyzed by Ferguson et al. and further factors are tabulated in [Table 4]. Detoxification is the process of weaning a person from a psychoactive substance in a safe and effective manner by gradually tapering the dependence producing substance or by substituting it with a cross-tolerant pharmacological agent and tapering it. This process minimizes the withdrawal symptoms, prevents complications and hastens the process of abstinence from the substance in a more humane way. Patients in alcohol withdrawal should preferably be treated in a quiet room with low lighting and minimal stimulation. All patients with seizures or DT should have immediate intravenous access for administration of drugs and fluids. Intramuscular lorazepam may be given to prevent further seizures. Adequate sedation should be provided to calm the patient as early as possible and physical restraints may be used as required in order to prevent injuries due to agitation. Fluid and electrolyte imbalances must be promptly corrected. Adequate nutrition must be ensured with care to prevent aspiration in over-sedated patients. Vitamin B supplementation helps to prevent Wernicke's encephalopathy (WE). In 1969, a landmark study by Kaim et al., proved beyond doubt that chlordiazepoxide (a benzodiazepine) was far better in preventing seizures and DT in patients with alcohol withdrawal compared to chlorpromazine, hydroxyzine, thiamine or placebo. Evidence is strongly in favor of the use of benzodiazepines to treat alcohol withdrawal states. , They unequivocally reduce the risk of severe alcohol withdrawals like seizures or DT. Among the benzodiazepines, chlordiazepoxide has a slight advantage over the other benzodiazepines or anticonvulsants. Anticonvulsants have not been proven to be better than benzodiazepines. They may be considered in mild withdrawal states due to their advantages of lower sedation and lower chances of dependence or abuse potential. However, they may not have the expected advantage of preventing seizures or DT in alcohol withdrawal states  and their use is not recommended in severe withdrawal states. Alcohol (in g) = Volume of liquor (ml) × 0.008 × (%) ethanol content in the liquor (w/v). The percentage of alcohol in various liquors  is: Beer (standard) - 3-4%, Beer (strong) - 8-11%, Wines - 5-13%, Fortified wines - 14-20%, Spirits/Indian Made Foreign Liquor like (rum/whiskey/gin/vodka/brandy) - 40%, arrack - 33%. One standard drink contains about 10 g of absolute alcohol or ethanol. A fixed daily dose of benzodiazepines is administered in four divided doses. The daily dose is calculated by using the aforementioned formula. Approximately 5 mg of diazepam equivalents [Table 5] is prescribed for every standard drink consumed. However, it needs to be based upon the severity of withdrawals and time since last drink. For example, a person presenting after 5 days of abstinence, whose peak of withdrawal symptoms have passed, may need a lower dose of benzodiazepines than a patient who has come on the second day of his withdrawal syndrome. Chlordiazepoxide and diazepam remain the agents of choice. However, in the presence of co-morbidities shorter acting drugs such as oxazepam and lorazepam are used. A ceiling dose of 60 mg of diazepam or 125 mg of chlordiazepoxide is advised per day. After 2-3 days of stabilization of the withdrawal syndrome, the benzodiazepine is gradually tapered off over a period of 7-10 days. This is best suited for out-patient setting. Patients need to be advised about the risks and to reduce the dose, in case of excessive drowsiness. In in-patient settings where intense monitoring is not possible due to lack of trained staff, a fixed dose regimen is preferred. The STT was proposed by Saitz et al. in 1994  where in chlordiazepoxide was given when CIWA-Ar ratings were eight or more. The STT requires close monitoring as in-patient. Patients who are non-verbal (e.g. stupor due to head injury) may not be suited for this regimen as they may not be able to inform the nursing personnel if they were to experience any withdrawal symptoms. This protocol is not safe in patients with a past history of withdrawal seizures because they can occur even in a patient without overt autonomic arousal or symptoms of alcohol withdrawal. STT decreases the duration of detoxification and dose of benzodiazepine required compared with fixed dose regimen and may be useful in patients who have never had complicated withdrawals. We recommend that clinicians take into account the past history of seizures or DT as well as the current clinical status while deciding upon medications for a patient. In the presence of an acute medical illness at present or a past history of severe withdrawals, a single loading dose of 20 mg diazepam should preferably be given immediately and the patient be monitored for further signs of alcohol withdrawal. Further doses of diazepam (20 mg) should be given orally every 2 h until CIWA-Ar scores are less than ten. Up to three doses are required in most patients,  which helps in reliably preventing the occurrence of withdrawal seizures. This strategy, which could aptly be called SML combines the principles and advantages of a STT, whereas at the same time takes into account a past history of severe withdrawals and gives a loading dose regardless of the appearance of symptoms. This method is recommended only in patients with DT. Frequent boluses of diazepam are given intravenously until the patient is calm and sedated. It is described under management of DT below. In the presence of risk factors like an acute medical illness or a past history of severe withdrawals, a single dose of 20 mg of diazepam should be given immediately as a loading dose and the patient be monitored for further signs of alcohol withdrawal,  further doses being guided by the appearance of withdrawal symptoms. In these cases, we recommend that patients should be started immediately on a SML dose regimen, while monitoring the withdrawal severity (CIWA-Ar ratings) and clinical signs of tachycardia and hypertension. A fixed dose regimen can be safely used in such patients in case adequate trained personnel are not available or if outpatient treatment is advised. In patients who present with seizures, a thorough neurological and general medical evaluation is a must to detect alternative cause of seizures. Patients with new onset seizures should preferably undergo brain imaging. Neurological work-up and consultation is essential in patients with more than six seizures during alcohol withdrawal, seizures persisting for more than 6 h or despite adequate dose of benzodiazepines treatment,  presence of focal seizures/change in seizure type, history of traumatic brain injury, family history of seizures in relatives who do not use alcohol, status epilepticus, focal neurological deficits, presence of meningeal irritation or patients with worsening sensorium despite at least 8 h of loading dose diazepam (60 to 80 mg). Treatment of alcohol withdrawal delirium DT is defined by the goal of achieving a calm, but awake state  or light somnolence defined as a sleep from which the patient is easily aroused. This goal is best achieved by the use of intravenous diazepam administered at frequent intervals while closely monitoring the patient during the procedure. Intravenous or intramuscular lorazepam may be used in patients with hepatic disease, pulmonary disease or in the elderly where there is risk of over-sedation and respiratory depression with diazepam. A review by Hack et al. suggests that a high requirement of intravenous diazepam (more than 50 mg in the 1 st h, or 200 mg or more within the first 3 h) with poor control of withdrawal symptoms is a marker of non-response of DT to benzodiazepines. Such patients can be diagnosed to have refractory DT after a review of the clinical condition to rule out medical or neurological causes of delirium. They can be given oral (or intravenous) loading with phenobarbital 100-200 mg/h, which has been shown to as effective as or better than diazepam front-loading for patients in DT in a more recent retrospective chart review. The use of barbiturates is justified by the fact that they are also GABA-enhancing drugs that have a different receptor profile than benzodiazepines and have been tested in a double-blind protocol against diazepam for DT. However, it carries the risk of over-sedation, especially in the elderly or in presence of hepatic disease and a risk of respiratory depression in patients with pulmonary disease. There is no antidote to barbiturate toxicity. For these reasons, barbiturates have fallen out of favor. An alternative adjunctive medication useful in patients with refractory DT is haloperidol given in doses of 0.5-5 mg by intramuscular route every 30-60 min  or 2-20 mg/h  while continuing to give diazepam 10-20 mg every 1-2 h. Newer antipsychotics like risperidone (1-5 mg/day) or olanzapine (5-10 mg/day) may have a better safety profile than haloperidol (2, 5-10 mg/day)  and are preferred as adjuncts to benzodiazepine treatment. In patients who do not respond to benzodiazepines and haloperidol, propofol infusion (0.3-1.25 mg/kg/h) in an intensive care setting has been used in a few cases. The risks of propofol infusion include bradycardia, hypotension, metabolic acidosis, acute pancreatitis and lipid abnormalities. Moreover, propofol may not treat the underlying withdrawal syndrome because patients are often noted to exhibit withdrawal symptoms soon after stopping propofol infusion. This is a unique form of withdrawal related psychosis which can begin even while the person is continuing to use alcohol or begins after he stops alcohol. Hallucinations occurring in clear sensorium are the hallmark of this disorder. A cluster analysis of alcohol withdrawal symptoms by Driessen et al. showed that hallucinosis is a severe form of alcohol withdrawal and is often associated with DT. However, it is one of the conditions that may cause apparent failure of the loading dose regimen  and we recommend a fixed dose strategy to cover the period of alcoholic hallucinosis. The patient may be given low doses of antipsychotics like chlorpromazine 100-200 mg/day or risperidone 1-3 mg/day to control severe agitation due to hallucinations. The hallucinations last about a week in most cases, but may last up to 1 month in some patients after which the antipsychotic can be stopped. Chronic alcohol use is associated with abnormal magnesium metabolism. Those with neuropathy and presenting with severe withdrawal symptoms are more likely to show low serum magnesium level. Oral or parenteral magnesium supplementation may benefit such patients by reducing the severity and duration of alcohol withdrawal. Routine use is not advised  [Table 6]. Benzodiazepines are the mainstay of management of alcohol withdrawal states. STT regimen reduces dose and duration of detoxification compared with traditional fixed dose regimen in mild to moderate alcohol withdrawal. However, it is feasible only in relatively stable patients and requires periodic monitoring of the withdrawal severity by trained personnel. For management of severe withdrawals, inpatient care and SML dose is advised. Though rapid loading is advised in DT, the few trials and retrospective chart reviews in DT have used a loading dose regimen. Refractory DT can be managed with phenobarbital or adjuvant antipsychotics. Thiamine supplementation should be routinely prescribed to prevent WE. 1. Koob GF. The neurobiology of addiction: A neuroadaptational view relevant for diagnosis. Addiction 2006;101 Supp 1:23-30. 2. Rogawski MA. Update on the neurobiology of alcohol withdrawal seizures. Epilepsy Curr 2005;5:225-30. 3. Miller NS, Gold MS. Management of withdrawal syndromes and relapse prevention in drug and alcohol dependence. Am Fam Physician 1998;58:139-46. 4. Bayard M, McIntyre J, Hill KR, Woodside J Jr. Alcohol withdrawal syndrome. Am Fam Physician 2004;69:1443-50. 5. Tovar R. Diagnosis and treatment of alcohol withdrawal. J Clin Outcomes Manag 2011;18:361-70. 6. Rathlev NK, Ulrich AS, Delanty N, D'Onofrio G. Alcohol-related seizures. J Emerg Med 2006;31:157-63. 7. Haber NL, Proude E, Lopatko O. Alcohol withdrawal management. In: Guidelines for the Treatment of Alcohol Problems. Ch. 5. Sydney, NSW: Ageing DoHa; 2009. 8. Sullivan JT, Sykora K, Schneiderman J, Naranjo CA, Sellers EM. Assessment of alcohol withdrawal: The revised clinical institute withdrawal assessment for alcohol scale (CIWA-Ar). Br J Addict 1989;84:1353-7. 9. Chabria SB. Inpatient management of alcohol withdrawal: A practical approach. Signa Vitae 2008;3:24-9. 10. Manikant S, Tripathi BM, Chavan BS. 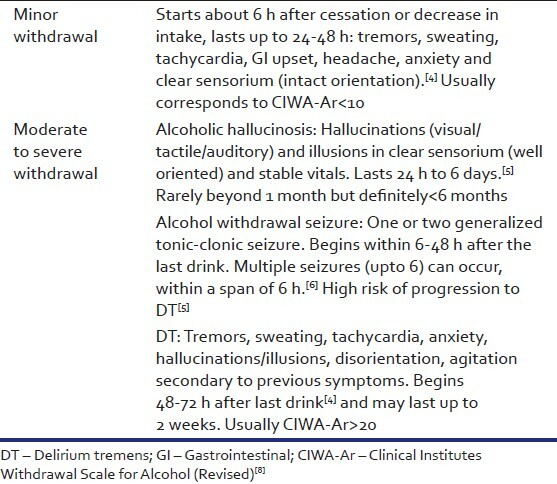 Utility of CIWA-A in alcohol withdrawal assessment. Indian J Psychiatry 1992;34:347-50. 11. Bharadwaj B, Bernard M, Kattimani S, Rajkumar RP. Determinants of success of loading dose diazepam for alcohol withdrawal: A chart review. J Pharmacol Pharmacother 2012;3:270-2. 12. Ferguson JA, Suelzer CJ, Eckert GJ, Zhou XH, Dittus RS. 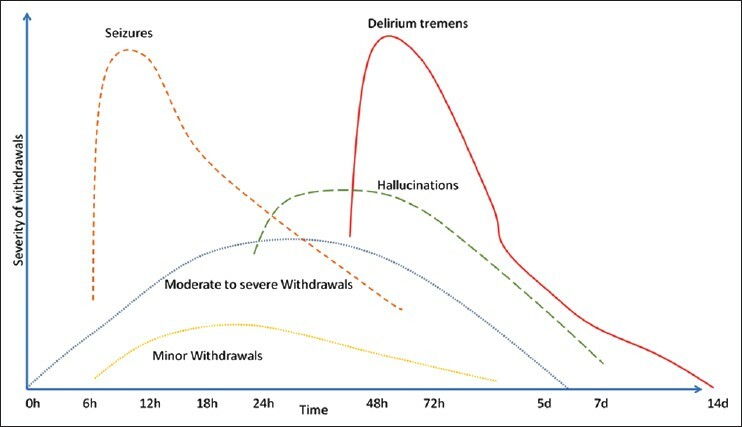 Risk factors for delirium tremens development. J Gen Intern Med 1996;11:410-4. 13. Saitz R, O'Malley SS. Pharmacotherapies for alcohol abuse. Withdrawal and treatment. Med Clin North Am 1997;81:881-907. 14. Lal R. Pharmacotherapy of substance use disorders. In: Lal R, editor. Substance Use Disorders: Manual for Physicians. New Delhi: National Drug Dependence Treatment Center, All India Institute of Medical Sciences; 2005. 15. Kaim SC, Klett CJ, Rothfeld B. Treatment of the acute alcohol withdrawal state: A comparison of four drugs. Am J Psychiatry 1969;125:1640-6. 16. Holbrook AM, Crowther R, Lotter A, Cheng C, King D. Meta-analysis of benzodiazepine use in the treatment of acute alcohol withdrawal. CMAJ 1999;160:649-55. 17. Amato L, Minozzi S, Vecchi S, Davoli M. Benzodiazepines for alcohol withdrawal. Cochrane Database Syst Rev 2010;3:CD005063. 18. Amato L, Minozzi S, Davoli M. Efficacy and safety of pharmacological interventions for the treatment of the alcohol withdrawal syndrome. Cochrane Database Syst Rev 2011;6:CD008537. 19. Eyer F, Schuster T, Felgenhauer N, Pfab R, Strubel T, Saugel B, et al. Risk assessment of moderate to severe alcohol withdrawal - Predictors for seizures and delirium tremens in the course of withdrawal. Alcohol Alcohol 2011;46:427-33. 20. Bhushan K, Gangadhar BN. Acute effects of alcohol, opioid and cannabis use. In: Lal R, editor. Substance Use Disorder: Manual for Physicians. New Delhi: National Drug Depndence Treatment Center, All India Institute of Medical Sciences; 2005. 21. Dubovsky SL. Benzodiazepine receptor agonists and antagonists. In: Sadock BJ, Virginia A, Ruiz P, editors. Kaplan and Sadock's Comprehensive Textbook of Psychiatry. 9 th ed. Philadelphia: Lippincott Williams and Wilkins; 2009. 22. Stern TA, Gross AF, Stern TW, Nejad SH, Maldonado JR. Current approaches to the recognition and treatment of alcohol withdrawal and delirium tremens: "old wine in new bottles" or "new wine in old bottles". Prim Care Companion J Clin Psychiatry 2010;12:e1-9. 23. Sellers EM, Naranjo CA, Harrison M, Devenyi P, Roach C, Sykora K. Diazepam loading: Simplified treatment of alcohol withdrawal. Clin Pharmacol Ther 1983;34:822-6. 24. Manikant S, Tripathi BM, Chavan BS. Loading dose diazepam therapy for alcohol withdrawal state. Indian J Med Res 1993;98:170-3. 25. Sellers EM, Sandor P, Giles HG, Khouw V, Greenblatt DJ. Diazepam pharmacokinetics after intravenous administration in alcohol withdrawal. Br J Clin Pharmacol 1983;15:125-7. 26. Saitz R, Mayo-Smith MF, Roberts MS, Redmond HA, Bernard DR, Calkins DR. Individualized treatment for alcohol withdrawal. A randomized double-blind controlled trial. JAMA 1994;272:519-23. 27. Devenyi P, Harrison ML. Prevention of alcohol withdrawal seizures with oral diazepam loading. Can Med Assoc J 1985;132:798-800. 28. D'Onofrio G, Rathlev NK, Ulrich AS, Fish SS, Freedland ES. Lorazepam for the prevention of recurrent seizures related to alcohol. N Engl J Med 1999;340:915-9. 29. Mayo-Smith MF, Beecher LH, Fischer TL, Gorelick DA, Guillaume JL, Hill A, et al. Management of alcohol withdrawal delirium. An evidence-based practice guideline. Arch Intern Med 2004;164:1405-12. 30. Kramp P, Rafaelsen OJ. Delirium tremens: A double-blind comparison of diazepam and barbital treatment. Acta Psychiatr Scand 1978;58:174-90. 31. Wasilewski D, Matsumoto H, Kur E, Dzikliñska A, WoŸny E, Stencka K, et al . Assessment of diazepam loading dose therapy of delirium tremens. Alcohol Alcohol 1996;31:273-8. 32. Hack JB, Hoffmann RS, Nelson LS. Resistant alcohol withdrawal: Does an unexpectedly large sedative requirement identify these patients early? J Med Toxicol 2006;2:55-60. 33. Hjermø I, Anderson JE, Fink-Jensen A, Allerup P, Ulrichsen J. Phenobarbital versus diazepam for delirium tremens - A retrospective study. Dan Med Bull 2010;57:A4169. 34. DeBellis R, Smith BS, Choi S, Malloy M. Management of delirium tremens. J Intensive Care Med 2005;20:164-73. 35. Driessen M, Lange W, Junghanns K, Wetterling T. Proposal of a comprehensive clinical typology of alcohol withdrawal - A cluster analysis approach. Alcohol Alcohol 2005;40:308-13. 36. Thomson AD, Cook CC, Touquet R, Henry JA, Royal College of Physicians, London. The royal college of physicians report on alcohol: Guidelines for managing Wernicke's encephalopathy in the accident and emergency department. Alcohol Alcohol 2002;37:513-21. 37. Thomson AD, Marshall EJ. The natural history and pathophysiology of Wernicke's Encephalopathy and Korsakoff's Psychosis. Alcohol Alcohol 2006;41:151-8. 38. Baines M, Bligh JG, Madden JS. Tissue thiamin levels of hospitalised alcoholics before and after oral or parenteral vitamins. Alcohol Alcohol 1988;23:49-52. 39. Cook CC, Hallwood PM, Thomson AD. B Vitamin deficiency and neuropsychiatric syndromes in alcohol misuse. Alcohol Alcohol 1998;33:317-36. 40. Hack JB, Hoffman RS. Thiamine before glucose to prevent Wernicke encephalopathy: Examining the conventional wisdom. JAMA 1998;279:583-4. 41. Sullivan JF, Lankford HG, Swartz MJ, Farrell C. Magnesium metabolism in alcoholism. Am J Clin Nutr 1963;13:297-303.